More house tonics served chilled. Oh, hey! His first song is called Club Soda! What a coincidence! As a delicious club soda is poured, a jazzy little number (not far off from what we might get from Daft Punk in their sophomore days) plays with a modest bassline and a synth with a nice "wow" sound. (How else can I describe a synth that sounds that way? Hmmm...) Unfortunately, the track doesn't really progress past this one stage, smooth and enjoyable though that one stage definitely is. It's basically something to play in the background while you chill with your icy beverage of choice. Something Extra Dry, perhaps? Now here's a song beyond description. Using what seems to be a strange random combination of notes, this sounds like it came out of a child's toy I used to own. Bangalter likes to cut out certain notes or fiddle with the filters to morph the song, but I am not fooled. This is a strange song, and that's all I can say. Shuffle! may cause a couple of people on the dancefloor to indeed shuffle to its slow introduction of phased spacey samples over the basic club beats, but Shuffle! feels very, VERY empty. It would likely only fit in a DJ set if someone was looking for a cooldown opportunity to say a few words to the crowd without any melodies getting in their way. But Colossus is clearly the star of the show with its raw, unapologetic power. Starting off with a disco bassline and piano combo, we're soon thrown into a thump-hungry mashup of elements, culminating in a climax with the eventual inclusion of a chipper squealing synth that simply makes the package complete. There's no doubt in my mind that this is the best of the bunch. Bangalter then closes the show with Turbo, a song sharing similar elements to Extra Dry. Grabbing just a few notes out of thin air and repeating ad nauseum, Turbo plays around with filters here and there while eventually adding in a grunty bassline, but it never really reaches an apex. I'm not even sure what makes this song "turbo", aside from the fact that I might be inclined to rush to the skip button in turbo speed. Not terrible, but definitely lacking in variety. 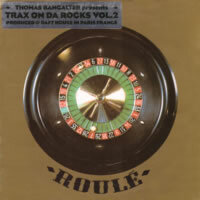 Trax On Da Rocks Vol. 2 suffers from the same downfall as the first volume: very little in terms of variety. Luckily, the songs here aren't especially long, so you can probably survive one full-length listening without extensively furrowing your brows in an annoyed fashion. If you like Daft Punk's early works, or if you enjoyed the first Trax On Da Rocks, you may be inclined to see what Thomas Bangalter does in the studio when Guy-Man's out shopping for groceries. Otherwise, you likely won't be impressed.